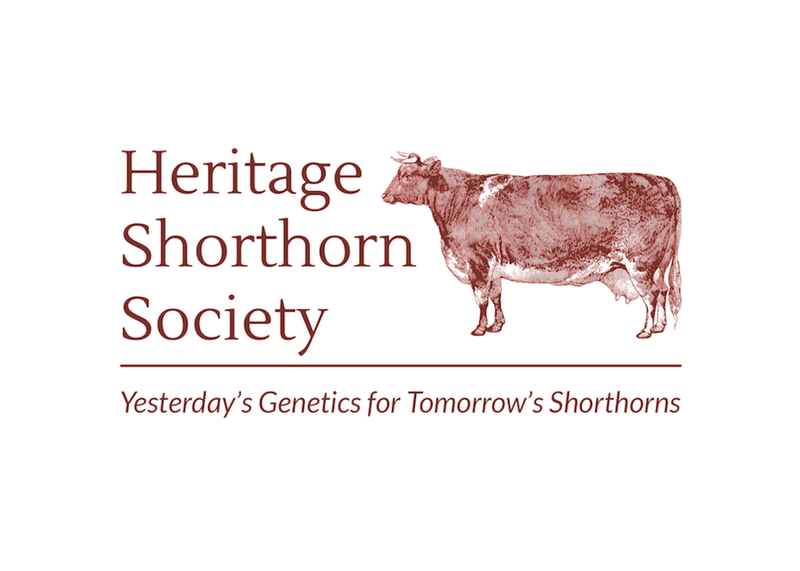 As we embark on a new year I believe most Shorthorn breeders are filled with excitement about the possibilities of the new calves that will be born this spring. Certainly that is my viewpoint as I countdown to the first calf that will be born in early February at our farm. So far we have had a relatively mild fall/winter but have recently “fallen” into our typical weather pattern this time of year with cool, foggy, and rainy days. Fortunately our cows are well adjusted to our weather vicissitudes and they adjust accordingly. I am intrigued by this topic because it has been on my radar for over 10 years. I have been tempted to write about it for the last couple of years but decided to let it play out a little longer to have a better handle on the “players” involved and whether it is likely that artificial/cultured meat and alternative milk will have much of an impact on the cattle industry. Given recent developments involving financing, production, regulation, and consumer acceptance it is only a matter of time before alternative meat and milk products start to grab market share away from all current “players” in the traditional production of meat and milk. Anyone who thinks different simply has not been paying attention as momentum is quickly building for these products to occupy significant grocery shelf space. Its coming is just a question of how pervasive it will be and how soon it will happen. Everyone involved in breeding Beef/Milking Shorthorns needs to become informed on this topic, understand the implications, and develop a plan to survive in this developing new reality. Any discussion of the role of animal based food products in society must now include the alternatives. Certainly we all have heard of the “Veggie Burger” but it was simply a stepping stone to what is happening now in alternatives to animal food products. Research and production of non-animal meat and dairy products can be broken down into two categories, plant based products and cultured cellular products. There are a plethora of examples of plant based products that include the aforementioned “Veggie Burger” and the many different “milk” products (soy, rice, and almond). Plant based products utilize different plant constituents that are reformulated into meat and dairy with flavoring, colors and texture incorporated to produce a product similar to the”real thing”. 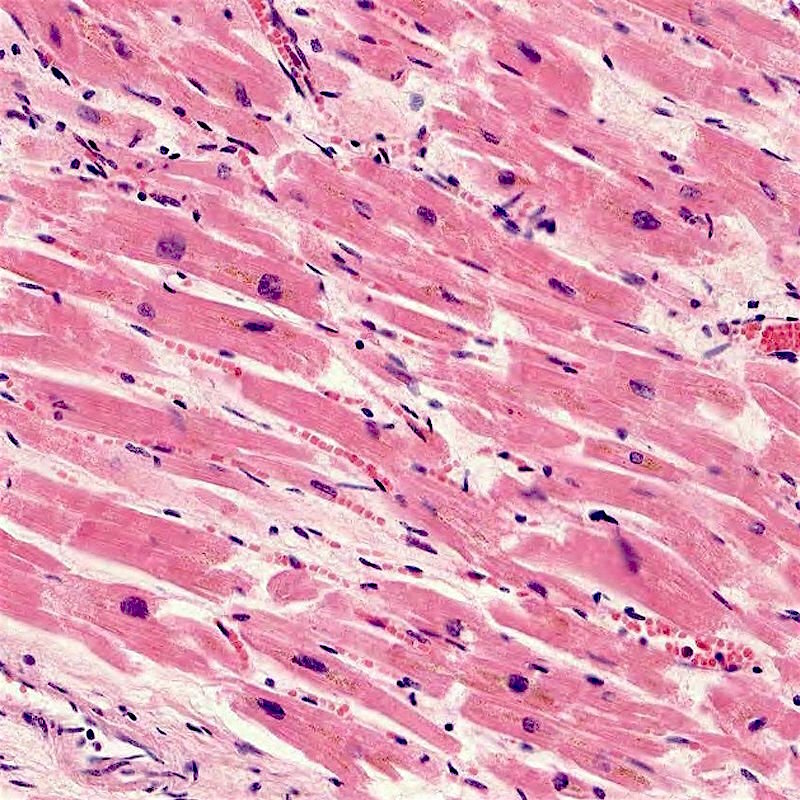 Muscle cells can be propagated in a laboratory. A different avenue is cultured cellular products which encompass a wide and evolving range of scientific developments. These include taking cells from animals (ex. muscle cells) and then letting the cells rapidly proliferate in special mediums (broths) that enhance cell replication and produce actual muscle tissue. Fostering this tissue onto a cellular infrastructure, which may be made from connective tissue, can result in steaks or chicken breasts that look and taste similar to what is purchased in the grocery store yet no live animal was involved in the production. Using the old Dupont moniker “Better Living Through Chemistry” may be the most appropriate description of this futuristic technology that will soon be in restaurants and grocery stores. There are a myriad of companies looking at producing cellular bioengineered animal free food products with extensive financial backing from individuals (such as Warren Buffet and Richard Branson) to companies (like Cargill and JBS). Given the diverse financial investments by many different entities, some take the “high road” saying it is about saving the environment, producing healthier food and saving animals from “slavery”. Others would say it is just about the money. Actually it is both. Why Have Animal Free Meat/Dairy Products Come To the Fore Front? This is a complicated question involving climate change, environmental degradation, health, changing human values such as the increasing numbers of vegetarians, and of course money. Most Shorthorn breeders are aware of many of the arguments being made against animal agriculture but it is important to focus on the most salient. Climate change and environmental degradation have been discussed ad nauseam with regard to cattle production. Opinions vary to such an extent that the truth can be difficult to sort out. Suffice it to say that cattle do have an impact but how much and whether it is detrimental is still up for debate. Health and the consumption of milk and meat in its natural form has continually been re-evaluated in human nutrition but it is still generally promoted as part of a healthy diet. Call it the “Bambi Syndrome” or animal rights but going forward, the use of animals in any form by humans is viewed negatively by increasing numbers of people. This evolving philosophy creates tremendous entrepreneurial opportunities for businesses willing to develop alternative non-animal meat/milk products. While researching this article I was surprised by the amount of research and money that is being put toward alternatives to animal produced foods. 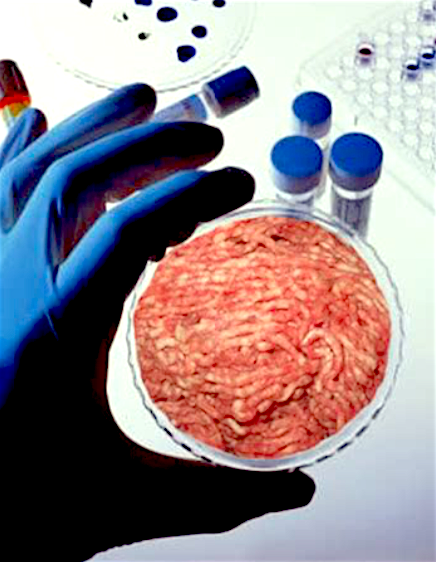 There are a litany of “start ups” with extensive financial backing geared toward producing cultured and cell-based non-animal products including substitutes for beef, chicken, turkey, pork, and fish. 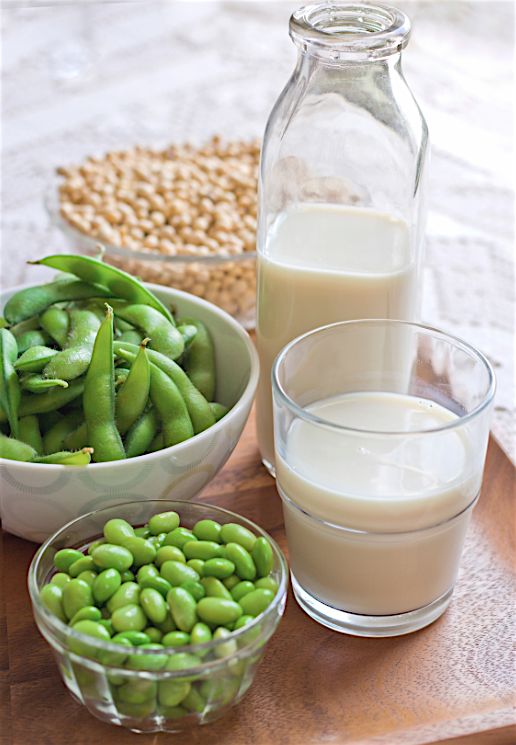 Most people are aware of the plant based products including the different types of “milk” (soy, almond, and rice). One company, Perfect Milk, is actual trying to produce milk through a molecular process that produces whey and other proteins that are replicas of what is found in cow’s milk. In essence they say they are creating a “natural milk”. Another example of the animal products without animals movement is “New Harvest” which is a non-profit research institute that funds cellular bioengineering for the production of animal products without animals. They provide grants to both PhD candidates and Post-Doctoral students whose research would be concomitant with New Harvest’s goals. With the amount of money being poured into both the development and promotion of animal-free meat & dairy products and the fervor of the movement it is not difficult to conclude that they will play an increasing role in food production. 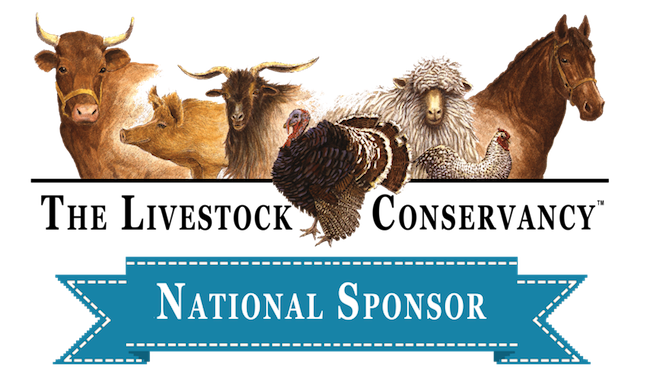 Entities such as the National Cattlemen’s Beef Association (NCBA) are suddenly very concerned about the implications of this “movement” partly because they are finally realizing “it has legs” and is a real threat to the beef industry, dairyman, and chicken producers etc. A huge fight is brewing over the regulation, production, and marketing/labeling of animal-free meat and dairy products. Recently steps have been taken to address these issues by the Federal Government through meetings with “stakeholders”. Currently the thought is that the Federal Drug Administration (FDA) will oversee the initial stages of production of lab-grown products including cell types, storage, and cell growth. The Food Safety and Inspection Service (FSIS) will regulate the production and processing of cell cultured products as well as labeling. The real difficulties involve definitions and labeling. What products qualify to be described as meat or milk? Obviously the definition of meat means one thing to NCBA and another to Memphis Meats who produce a cell cultured product. The labeling issue is critical to marketing for both groups because consumer acceptability will be based on name, nutritional value, taste, texture, and cost. For those who have spent their whole lives producing animal based products, such as beef and milk, the concept of a non-animal product that can compete on both quality and price is a real threat to their livelihood. Regardless of one’s own allegiance to the use of animals in everyday life the reality is that, as Bob Dylan would put it, “The Times They Are A-Changin”. 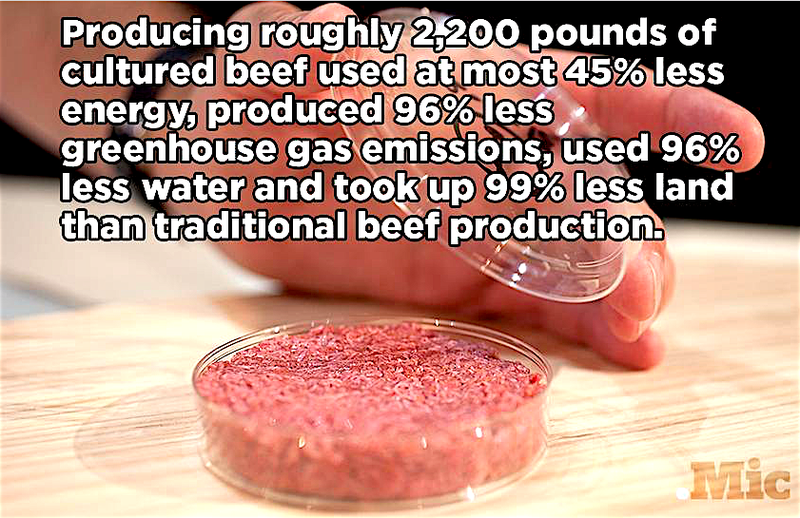 Regardless of how accurate or inaccurate the %’s are, this is an example of advertising by proponents of cultured “meat”. With the continuing evolution of the quality of animal-free food products, the reduction in their costs, and public acceptance the reality is that animal food production may be greatly reduced and perhaps long term eliminated. Cost is another critical factor. With increased government regulation & oversight the costs for raising and managing live animals will dramatically escalate for the average producer of beef, milk, chicken, etc. The truth is that a lot of producers will be regulated out of business partly by the rising onslaught of environmental based rules, new government fees, and consumer concerns. At some point consumer scrutiny of feedlot beef production practices will result in even greater damage to the beef industry as consumers realize how ubiquitous hormonal implant usage is in the beef industry. As I have said before, I look to the EU when it comes to the rules and regulation of animal production as they foreshadow what will eventually happen in the USA. They do not allow hormonal implants. My crystal ball is limited but hopefully I can still provide some insight into where all this is going. I believe that the production of animal-free meat and dairy products will advance much quicker than most people believe and that it will greatly reduce the production of live animal food products simply because the alternatives will gain consumer acceptance, and animal production costs will rapidly escalate. I think this will happen over the next 10-25 years. Furthermore, the burgeoning animal rights movement will lead to more regulation of ownership and potentially the outright banning of certain uses of animals in food production. This may take a little longer but it will happen. For most readers this article is undoubtably a bit depressing so I will try to end it on a positive note. 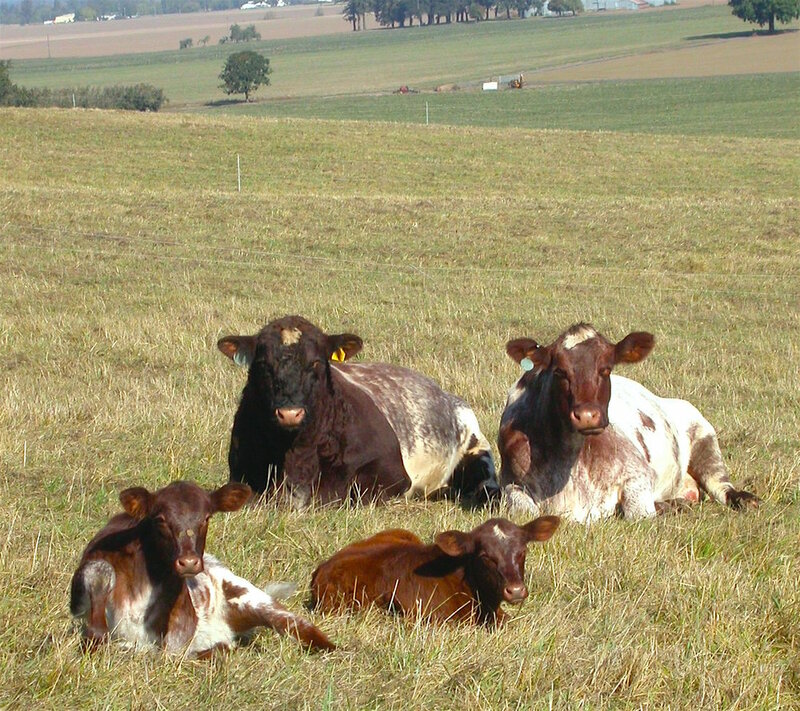 By utilizing more traditional production methods, selecting animals/Shorthorns that tread lightly on the environment, that live longer through better care with less production stress, have increased consumer acceptance through telling their story, and most importantly have a superior product the future may actually be fairly bright. On the other hand, if we do not rebrand our products and distance ourselves from current animal production modalities that treat animals as simple commodities, then we will also be cast on the history pile sooner than most think. Personally I embrace the challenge and believe success will be ours through changes in production and marketing. There will always be people who value a completely natural, traditional source for their meat and dairy products—we need to cultivate this market.